Anyway…let’s get to the good stuff. 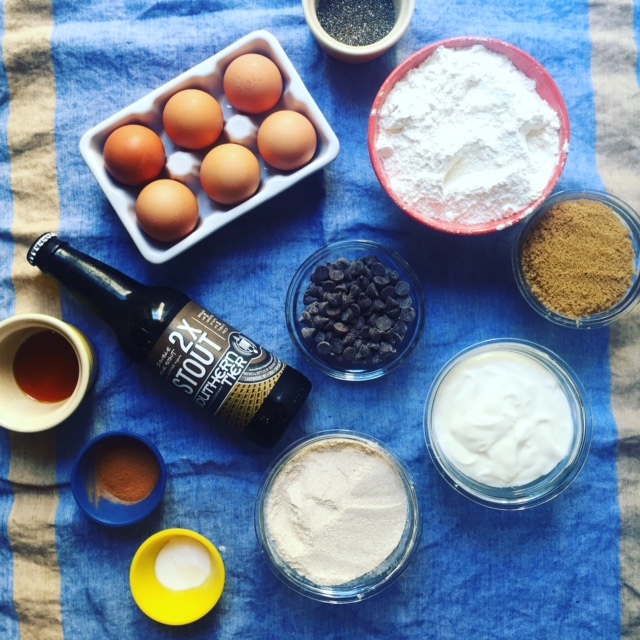 Not only can you sip beer, you can cook and bake with it too. Here’s a delicious recipe from Eating in Color that is perfect for these crisp fall days. Don’t worry about serving it to your kids, nearly all of the alcohol will be gone after the baking process and with only 1/2 cup in the whole recipe, there’s very little per serving. As far as which stout to use, I really like Brooklyn Brewery Black Chocolate Stout, as well as Southern Tier Brewing Company’s 2X Stout. You can bake this in a traditional loaf pan or use a muffin tin. Combine the flours, salt, baking soda, flax, sugar, and cinnamon in a large bowl. Combine the stout, yogurt, egg, butter, and vanilla in another bowl. Make a well in the center of the dry ingredients and add the wet ingredients. Combine well with a spatula. Spray a 9-by-5-inch (23-by-12.75-cm) loaf pan with cooking spray, then pour in the bread mixture. Place the chocolate chips in a microwave-safe bowl and microwave for 40 seconds; stir and microwave for another 20-30 seconds until fully melted. Drizzle the chocolate over the bread and using a butter knife, create a swirled pattern on top. Bake for 40 minutes, until the top of the loaf feels dry and a sharp knife inserted into the middle comes out clean. Let cool for 10 to 15 minutes in the pan, then remove the loaf from the pan and slice.